Vaccines which have been approved by the responsible government authorities for vaccination against the alleged H1N1 Influenza A Swine Flu have been found to contain nanoparticles. Vaccine makers have been experimenting with nanoparticles as a way to “turbo charge” vaccines for several years. Now it has come out that the vaccines approved for use in Germany and other European countries contain nanoparticles in a form that reportedly attacks healthy cells and can be deadly. There is only one small problem with vaccines containing nanoparticles, they can be deadly and at the least cause severe irreparable health damage. 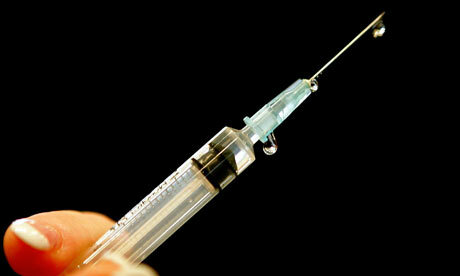 The article describes tests carried out in 2008 at the elite Beijing Chaoyang Hospital on seven young women. All seven, ages 18-47 had been exposed to nanoparticles for 5-13 months in their common workplace. All were admitted to the hospital with shortness of breath and pleural effusions, or excessive fluids surrounding the lungs, inhibiting breathing. None of the seven had ever smoked and none were in any special risk group. Doctors carefully tested for every possibility and confirmed that the lung problems had a common origin-regular inhalation of nanoparticles in their factory. They had been exposed to Polyacrylat nanoparticles. To date Animal studies and in vitro experiments show that nanoparticles can result in lung damage and other toxicity in animals, but no reports on the clinical toxicity in humans due to nanoparticles prior to the Beijing study had been made. The Beijing Chaoyang Hospital study has now conclusively confirmed that nanoparticles cause lung damage and other toxicity in humans as well. 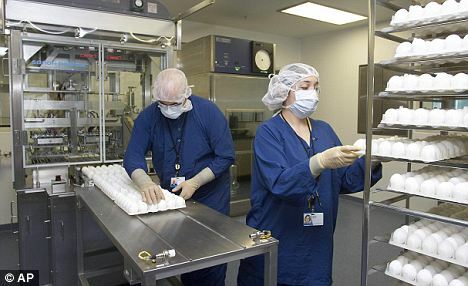 At this point in time, when two of the approved vaccines planned to be mass distributed in Germany and elsewhere contain nanoparticles, failure of the relevant responsible public health and epidemiology officials to order an immediate emergency freeze on distribution of any vaccine containing nanoparticles can only be considered tantamount to criminal negligence. Hopefully the responsible authorities will react in time to avert a possible human health catastrophe orders of magnitude worse than the worst case of Swine Flu reported to date. (1) EPFL, Bioengineering researchers from the EPFL in Lausanne, Switzerland, have developed and patented a nanoparticle that can deliver vaccines more effectively, with fewer side effects, and at a fraction of the cost of current vaccine technologies, accessed in www.azonano.com/nanotechnology%20news.asp?catid=13. (2) Song Y, Li X, Du X, Exposure to nanoparticles is related to pleural effusion, pulmonary fibrosis and granuloma , European Respiratory Journal, 9/2009, 34(3): 559-567.